Keep in mind that funding from San Bernardino County has to be secured for the line to be extended to Montclair. Credit: Foothill Gold Line Construction Authority. The Metro Board today approved a $1.4-billion budget and partnership agreements to extend the Metro Gold Line in the San Gabriel Valley another 11.5 miles east to Claremont. Partnership agreements establish a funding plan and shared roles and responsibilities between Metro and the Foothill Gold Line Construction Authority, the agency that will build the extension. 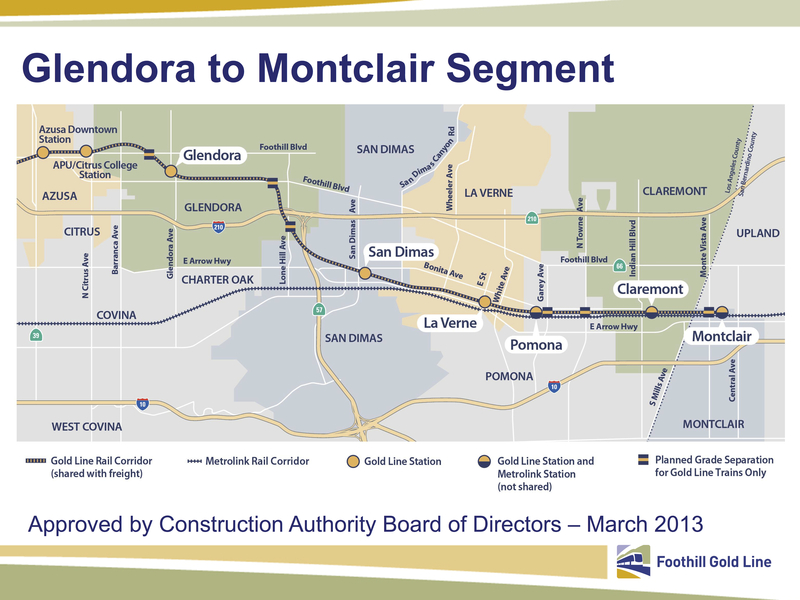 Metro will fund the portion of the new segment from Glendora to Claremont within Los Angeles County. The Construction Authority plans to utilize other funding to complete the line to Montclair in San Bernardino County as part of the overall project. The extension will be the first rail line to begin construction from a multitude of new transit projects funded by Metro’s Measure M half-cent transportation sales tax approved by L.A. County voters in November 2016. Under the terms of the funding agreement, Metro will use Measure M and other local and state funds to pay for construction. Metro plans to apply for a $249-million grant from the state’s Transit and Intercity Rail Capital Program to complete life-of-project budget requirements. Should that funding be unavailable, Metro will pursue other options and approaches to meet the full funding needs of the project. The Board also approved the transfer of an additional $26 million in cost savings from the Construction Authority’s Gold Line segment to Azusa, which opened in March 2016. Combined with previously approved savings, nearly $100 million of residual Measure R funds dedicated for the full Foothill Gold Line project will be used to complete the next segment from Glendora to Claremont. The Funding Agreement and Master Cooperative Agreement define the working relationships and processes needed for Metro to fund work and collaborate with the Construction Authority. These agreements set the foundation for identifying and implementing a detailed budget and means for disbursement, tracking and management of funds, safety and quality throughout the course of the design-build project. The extension will provide a safe, reliable transit alternative to driving the busy 210 and 10 freeways and offer a connection with Metrolink’s San Bernardino Line. A planned extension from Claremont to Montclair will add about another mile when funding is secured. A trip from Montclair to Pasadena should take just over 40 minutes, and a trip from Montclair to Los Angeles would be about 75 minutes. To date, the Construction Authority has environmentally cleared the project and completed advanced engineering for the entire alignment. The authority expects to award its first contract for advanced utility relocation later this year. The project’s official groundbreaking is planned for October, with plans to open to the public by 2027. For more Metro information about this program, please visit https://www.metro.net/projects/foothill-extension/. For more information from the Foothill Gold Line Construction Authority, please visit http://www.foothillgoldline.org/. Sigh. This is going to be a very expensive operations money sink. Or, it will be the reason for Metro to finally develop a rational regional fare policy that charges for distance travelled rather than mode or route. You clearly missed the fact that when the Gold Line was extended from Pasadena to APU/Citrus the demand for the service was so great that metro to had to do away with their stupid every other train to APU/Citrus and had to add 3 car trains during rush hour AND complaints about the lack of enough parking at stations! Now, common sense would tell you that the people driving maybe coming from points east of APU/Citrus, thus a need to extend the line! I certain hope Metro doesn’t do the stupid distance based fare system. Anybody who thinks that in the distance based system the fare for a 2 or 3 stop ride will be less than the current $1.75 fare, is just clueless! Great news. Just wondering why it takes 10 years to build when it has been environmentally cleared already. Still crazy that this line was prioritized over those in the denser parts of LA. Political support and an open, complete Right of Way. Add in the regions’ Job/Housing imbalance and you are building a line that has major future use, especially after the DT San Bernardino rail station opens to connect with sBx and later when the San Bernardino Line is either electrified or converted to DMU operations as is being studied. I hope there’s a plan to create trackways for express service. If it’s already an hour from Azusa to DTLA, 75-90 minutes from Montclair to DTLA would be a major deterrent from using it. A third reversible track, or two-tracks for full-time express and local service would be awesome. The plan is for two tracks between Azusa and Claremont with five stations — so basically is express-like service. The quicker but more expensive and less frequent ride to DTLA would be via Metrolink from Pomona or Claremont. The Gold Line will be good for frequent and pretty quick service to/between the Foothill Cities and may also be useful for some who don’t mind the ride to DTLA. During peak traffic times, I’m guessing the Gold Line to DTLA may be quicker than traffic for many of the existing and future Gold Line stations. I live in Pasadena, so I’d be interested to hear the opinions of others who live in the east side of the SGV. I’m on the south side of Arcadia, and the quickest way to get into DTLA is actually the Silver Line which takes 32 minutes from El Monte to 7th/Metro. From the Gold Line Arcadia Station it takes 35 mins to Union Station plus an additional transfer to most DTLA destinations. It appears to me that paralleling the Gold Line with Metrolink has several advantages: 1. Provide more frequent, all-day/late night service, 2. price advantage, 3. allow Pasadena access from points east, 4. relieve parking problems at existing stations. The one wrinkle here is the Regional Connector which will make it easier to continue on the train beyond Union Station — the train will stop in Little Tokyo, 2nd/Broadway, Bunker Hill and 7th/Metro before continuing on to Long Beach. Might be faster than the Silver Line, which can be impacted by traffic. It will also provide a feed from the west (San Dimas and La Verne) to the Pomona Metrolink station. It will also provide an alternate if there is trouble on the Metrolink. This extension should be built (eventually) given the popularity of the last one. Moreover, Metro should lobby the heck out of the new Ontario Airport Authority for support of extending further to ONT. The latter plans to boost its passenger traffic after years of neglect by LAWA. What masochist wants to drive to the airport unless there is no reasonable alternative? This long term project needs constant attention. As the Gold Line pushes east and its corridor parallels Metrolink, are there plans in the works to streamline Metrolink operations? Perhaps Metrolink can skip stops and reduce travel time. Not that I know of. Metrolink is trying to double track more of its system to speed up trains and reduce delays due to conflicts with freight trains. But that’s something different. It remains to be seen now much the Gold Line to Claremont will impact Metrolink ridership. I tend to feel like Metrolink will still do well serving commuters heading into DTLA whereas the Gold Line will serve a lot of folks traveling between SGV destinations with some riding all the way to and/or through DTLA. 10 years to complete this project? That seems like a very long time. I think it took 5 years to complete the Gold Line from Pasadena to Azusa. Why so long for the extension to Claremont? The “groundbreaking” is for advanced utility relocation, basically moving some of the power and gas lines and storm drains under the tracks in advance. While very important, it is not actual track grading. Remember that although a preliminary design was in the EIR, they actually have to do final design for the project, which requires verifying everything is in the ground and hasn’t changed in the 10-15 years since they last collected the data.